A total of 115 VLBW neonates were born during the study, out of which 55 neonates were excluded due to prespecified criteria [Figure 1]. Included neonates were randomized into two groups with 30 each in 2H and 3H feeding schedules, and followed up for outcome measures. The two groups had similar baseline variables [Table 1]. The incidence of feed intolerance was not different statistically between the two groups (30% vs. 23.3%, P = 0.56). The incidence of hypoglycemia, NEC, apnea, and time to reach full feeds were also not different between the two groups [Table 2]. Premji SS, Chessell L. Continuous nasogastric milk feeding versus intermittent bolus milk feeding for premature infants less than 1500 grams. Cochrane Database Syst Rev 2011;(11):CD001819. DOI: 10.1002/14651858.CD001819.pub2. Lane AJ, Coombs RC, Evans DH, Levin RJ. Effect of feed interval and feed type on splanchnic haemodynamics. Arch Dis Child Fetal Neonatal Ed 1998;79:F49-53. Bodé S, Dreyer M, Greisen G. Gastric emptying and small intestinal transit time in preterm infants: A scintigraphic method. J Pediatr Gastroenterol Nutr 2004;39:378-82. DeMauro SB, Abbasi S, Lorch S. The impact of feeding interval on feeding outcomes in very low birth-weight infants. J Perinatol 2011;31:481-6. Rüdiger M, Herrmann S, Schmalisch G, Wauer RR, Hammer H, Tschirch E, et al. 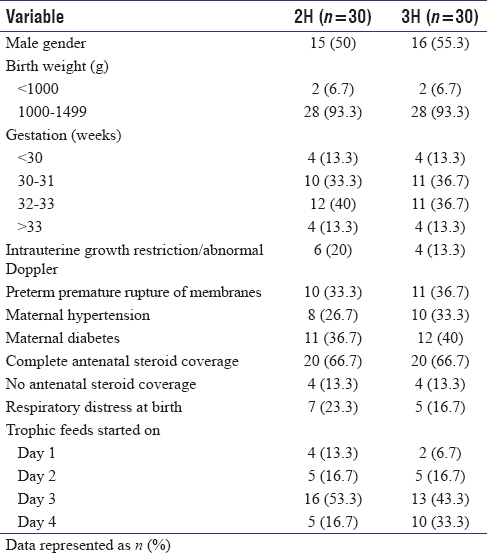 Comparison of 2-h versus 3-h enteral feeding in extremely low birth weight infants, commencing after birth. Acta Paediatr 2008;97:764-9. Ibrahim NR, Kheng TH, Nasir A, Ramli N, Foo JL, Alwi SH, et al. Two-hourly versus 3-hourly feeding for very low birth weight infants: A randomized controlled trial. Arch Dis Child Fetal Neonatal Ed 2017;102:F225-F229. Dhingra A, Agrawal SK, Kumar P, Narang A. A randomised controlled trial of two feeding schedules in neonates weighing ≤ 1750 g. J Matern Fetal Neonatal Med 2009;22:198-203. Ballard JL, Khoury JC, Wedig K, Wang L, Eilers-Walsman BL, Lipp R, et al. New Ballard score, expanded to include extremely premature infants. J Pediatr 1991;119:417-23. Lucchini R, Bizzarri B, Giampietro S, De Curtis M. Feeding intolerance in preterm infants. How to understand the warning signs. J Matern Fetal Neonatal Med 2011;24 Suppl 1:72-4. Bell MJ, Ternberg JL, Feigin RD, Keating JP, Marshall R, Barton L, et al. Neonatal necrotizing enterocolitis. Therapeutic decisions based upon clinical staging. Ann Surg 1978;187:1-7. Gray MM, Medoff-Cooper B, Enlow EM, Mukhopadhyay S, DeMauro SB. 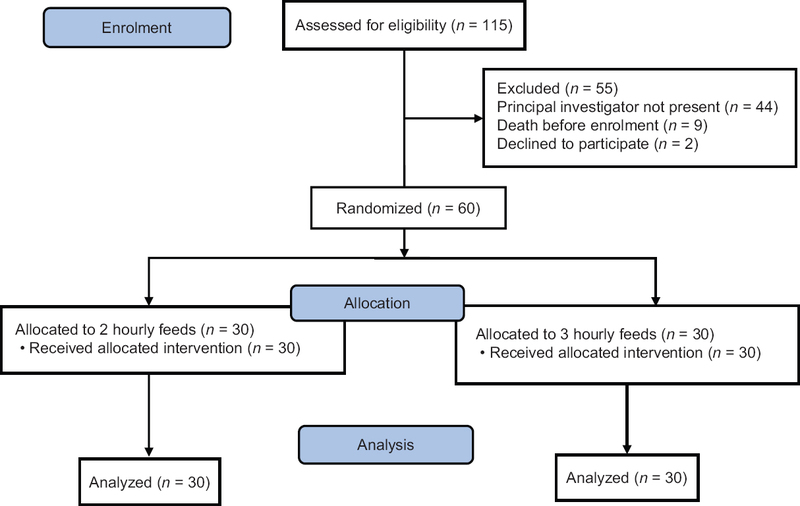 Every three-hour versus every six-hour oral feeding in preterm infants: A randomised clinical trial. Acta Paediatr 2017;106:236-41.